2. Attend writers’ conferences. If someone requests that you send something, send it. 3. Develop friendships. This is an industry of relationships. Create and maintain as many as you can. 4. Determine your target audience and write directly to them. 5. Puke your book out. Like that other stuff, you need to get it all out, then clean it up. 6. Write a query or a proposal, depending on whether you write fiction or nonfiction. 7. Rewrite your entire manuscript. If you wrote 90,000 words, edit out 9,000 of them. 8. Join a writers’ group. Find one that can help you improve, not tear you down. 9. Have your manuscript critiqued. 10. Keep your voice. Take suggestions from others, but don’t talk like them. 11. Build a platform Publishers use this info to decide who to publish. 12. Grow a thick skin. 13. Rewrite and have your manuscript critiqued again. 14. Repeat the last step as often as needed to get the best possible product. 15. 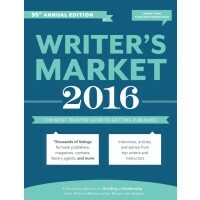 Acquire a current copy of books like the Writer’s Market Guide and/or Christian Writer’s Market Guide. 16. Send your query/proposal ONLY to agents or publishers who work in your genre. 17. Check out the agent’s/publisher’s website for submission guidelines and current contact information. 18. Keep accurate records of what you send to whom and when. 19. Wait. It takes 2-3 months or longer for most agents or publishers to respond. 20. Keep building your platform. 21. While you’re waiting, keep writing. 22. When you get a rejection letter, don’t take it personally. Think of it as a first date. 23. A rejection only means that the person who will love your manuscript is at a different address. 24. Keep a record of suggestions included in your rejections, if offered. 25. Wait. It could take a year or longer to get an agent. 26. When an agent accepts your work and wants to represent you, don’t pay them. They make money when your book sells. 27. Be nice to your agent, as he/she will now be the one getting your rejection letters. 28. Your agent might be working on a deal without giving you particulars. Don’t get upset with him/her, as having a meltdown may derail any plans in process. 29. Wait. It takes months, sometimes years, to get acceptance from a publisher. 30. Don’t hold out for an advance. Very few publishers offer any money up front. 31. When you get an offer from a publisher, read the contract before you sign it. 32. Research royalties offered and compare to the rest of the market. 33. Wait. Publishers schedule production months or years in advance. 34. Hire a publicist to set up radio and TV interviews for you. 35. Practice being interviewed. Your publicist will compose a list of questions for interviewers to use. Write your answers and have a friend role-play with you. 36. Find an image consultant who will help you look your best. 37. Research each interviewer ahead of time. It’s more personal if you have listened and know a little about them before your show. 38. Let all your friends and contacts (your platform) know about any interviews you have. 39. Write a thank-you note to the producer and the host after the interview. 40. Keep a detailed record of your appearances and contacts. 41. Marketing is up to you, not the publisher. Learn all you can about how to market your book and yourself. 42. Don’t quit your day job. Only about 5% of writers can support themselves and their families on what they earn writing. 43. Write every day. A painter paints, a baker bakes, and a writer writes. These are not in chronological order and you may work on more than one step at a time. This is not an exhaustive list, but it gives you an idea of what’s involved. Whatever your goal, don’t give up. You never know when your book might become the next bestseller. And you don’t want to quit right before that happens. NOTE: When I expanded this list into a book, I discovered a few more steps. What a great list, Debbie, especially the ones that start with "Wait." I'm waiting now, again, on an answer to a submission, but I'm revising another manuscript while I wait so the time is not totally lost. Wow! These are great, Debbie. I'm still puking out my third book, which is taking way too long. I'm ready to get to these other list items!